The Australian Region has had the pleasure of welcoming the Superior General, Fr Valdir José De Castro, and General Councillor, Br Darlei Zanon, for a canonical visit from 9-17 December, during which they had the opportunity to meet with all of the members in Australia, visit the two houses at Strathfield (Sydney) and Brisbane, and see the various apostolic activities. The story of the Society of St Paul’s foundation in Australia began in August 1952 when Fr Francis Borrano arrived in Sydney. Then a member of the United States Province, Fr Borrano had been sent by the founder of the Society of St Paul, Fr James Alberione, to investigate the possibility of beginning a foundation in Australia. Fr Borrano belonged to the first group of young men to pronounce their religious vows in the Society of St Paul, together with Fr Alberione, on 5 October, 1921. The Australian foundation can thus be traced to one of the original members of the congregation, one who was there when the congregation had its humble beginnings in Alba, in the Cuneo region of northern Italy. Fr Borrano remained in Australia for about ten months, initially as a guest of the Redemptorists before moving to the presbytery at St Joseph’s, Newtown, where he assisted in the ministry of the parish. He was not there long when he met a young man named Michael Byrnes who was an apprentice compositor/linotypist at The Catholic Weekly, the newspaper of the Sydney Archdiocese. He expressed an interest in studying for the diocesan priesthood but Fr Borrano pointed out that since he was already involved in the religious press and wanted to be a priest he could combine both by becoming a member of the Society of St Paul. At the end of his stay, Fr Borrano provided the founder, Fr Alberione, with a positive report on the potential for a Pauline mission in Australia and passed on a warm invitation from the Archbishop of Sydney, Cardinal Norman Thomas Gilroy, to establish a house in the Sydney Archdiocese. 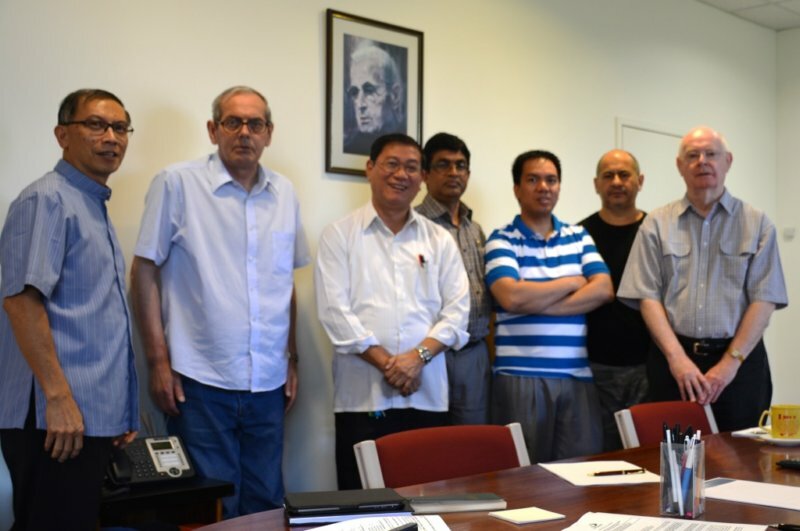 The decision to proceed was taken and Fr Bernard Gnata was chosen to begin the Pauline foundation in Australia. Also a member of the United States Province, he arrived in Australia on 16 June, 1953. Shortly after the Redemptorist congregation put at Fr Gnata’s disposal a small residence in Concord. It was to be the first centre of the Paulines in Australia. It had a small chapel in which Mass was celebrated and the Blessed Sacrament reserved. It was in that Chapel on about 20 August 1953 that the official commencement of the Australian foundation was marked with prayer and thanksgiving. A new Pauline mission had begun. The initial community comprised Fr Gnata and the aspirant, Michael Byrnes. With the help of some lay cooperators sympathetic to the ideals of the Society of St Paul an apostolic activity began. Religious books and pamphlets published in the United States were imported and distributed in Australia. One of the earliest outlets for these publications was the small bookshop attached to St Mary’s Cathedral. On 25 January 1954 the infant community moved to a larger house in Abbotsford Rd, Homebush. About this time, the office for the promotion and distribution of booklets and pamphlets was transferred Cusa House, a building owned by the Archdiocese in Elizabeth Street, Sydney. In time some 16,000 ACTS and Liguori pamphlets would be distributed every month from this office. "Note well that without sacrifice you cannot achieve anything. The cross cannot be placed only on the church steeple. It must also be planted in our hearts. All that is good costs. Don’t do only those things that are eye-catching, but focus on the little things, and keep going ahead day by day." Other Paulines arrived in due course. Br Luciano Melchioro arrived from Italy in March 1954 followed in August by Fr Mirko Cerato. This made possible an expansion in the promotion of religious literature and the commencement of a film distribution apostolate among the Italian community in Sydney. Shortly afterwards, Michael Byrnes, having made his religious vestition on 15 August, left for Rome to continue his formation. Shortly after this visit the Sisters of Jesus Good Shepherd (Pastorelle) came to Australia where they opened a house in Melbourne after a brief stay in Sydney. In 1957 the Sister Disciples of the Divine Master arrived in Sydney. Fr Alberione’s remarkable Pauline Family was now well and truly established in Terra Australis. 1957 saw the arrival of Fr Jerome Casolari and Br Alphonsus Panaro from the Philippines. Br Alphonsus was one of the many missionaries expelled from China in the 1950s. During this period a small printery was set up in a service station in Burlington Rd in Homebush. Since the community was living in a residential area it was impossible to have a printery on the premises. The return of Fr Casolari to the Philippines saw the arrival of Fr Marco Grossi from the same country. In 1959 he came to know that the Dominican Sisters who conducted St Lucy’s School for the Blind in Broughton Rd, Homebush, wished to move to Wahroonga and that the property was for sale. In December of that year the Society purchased the property and shortly afterwards took up residence. It continues to this day to be the principal residence (or ‘motherhouse’) of the Society of St Paul in Australia. Fr Grossi moved heaven and earth to get permission from Strathfield Council to allow the use of printing machinery on the newly acquired Broughton Rd property. Finally, Council allowed this under strict conditions. The few small printing machines were moved from the service station to the new property and a stable form of apostolate was established. Meanwhile, in Rome, the Founder was following events closely. He had sent two superiors from the Philippines and now, spinning the globe of the world that was always on his desk just a little, he decided to send superiors from Japan. The first of these, Fr Angelo Castellotto, arrived in 1961 while the second, Fr Paul Cirio, arrived in 1964. In March of 1963 the Founder made his second, and final, visit to his sons and daughters in Australia. He was well satisfied with all that had happened in the eight years since his previous visit, and exhorted the Paulines to intensify their efforts in bringing the Gospel to everyone, especially those most far from the light of Christ. The members were to take up this challenge by printing attractive and inexpensive editions of the New Testament and the Gospels. The Second Vatican Council, held from 1962-65, was immensely significant for the universal Church and for the publishing apostolate of the Society of St Paul. The various constitutions, decrees and declarations of the Council were printed, published and distributed by the Homebush community. Of particular significance were the changes in the liturgy that were introduced gradually in the years following the Council, including the introduction of the use of vernacular language in the liturgy. Throughout the late 1960s and early 70s Paulines published hundreds of thousands of copies, in various editions, of My Mass Companion, a pamphlet containing the ordinary parts of the Mass with the peoples responses. This expansion in printing and publishing activities was made possible by the arrival of more Paulines from overseas. Following his ordination in Rome in 1961, Fr Michael Byrnes returned to Australia in 1962. Shortly afterwards Br Paolo Putti arrived from Italy, Br Fidelis Kottoor from India and Fr Isidore Selvo from the Philippines. With the arrival of Br Lorenzo Mantovani in 1968, Fr Paul Marzilli in 1969 and Br John Ferrari in 1970 a greater degree of stability and organization became possible. The two Brothers were able to strengthen the printing plant with their expertise while Fr Paul Marzilli became Master of Novices for a number of young men who had entered the congregation. A number of these served for some years, making a generous contribution to the community, before deciding to leave. 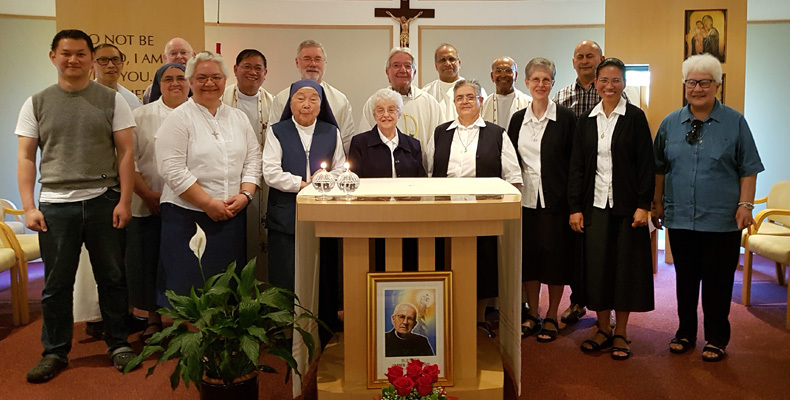 Two Australians who entered the congregation in the late 1960s completed their formation and continue to serve the congregation in Australia today in various capacities – Br Noel Bagnall and Fr Michael Goonan. During the 1960s the small book distribution centre that had begun in Cusa House in 1953 moved to larger premises in the Queen Victoria Building in George St, Sydney. Stocking a greater range of titles this became the first St Paul Book Centre, under the management of Fr Selvo. In 1970 the Centre was relocated to the Haymarket end of George St and the following year its management was transferred to the Daughters of St Paul. The Daughters continue to operate the Centre to this day. Now called Pauline Books and Media, it operates in spacious premises in Castlereagh St, Sydney. tive Italy in 1971 where he died a year later. 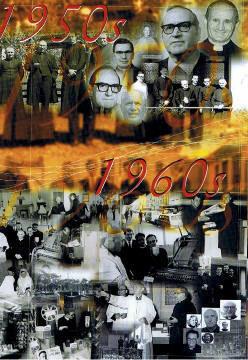 The 1970s were years of significant development for the apostolic activities of the Society of St Paul. With the publishing expanding, the original printing equipment was replaced by the latest machines and a larger printing building was constructed, along with a new residence to replace two older houses on the property. 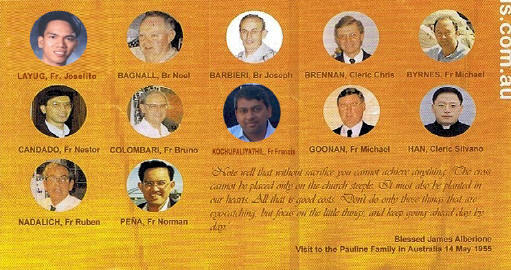 In 1978 Fr Paul Careddu joined the Sydney community and in the same year Br James Uppani, an experienced offset printer, came from India to assist with the developing printery. Development was also taking place in Melbourne. In 1970 the Society purchased a 15 acre property in the outer Melbourne suburb of Scoresby (later called Wantirna Sth), where work commenced on a house of formation. Tragically, in January 1972, while the house was being constructed, Br Alphonus Panaro was killed in a tractor accident. This hardworking brother, who as a young man had survived a massive fall from the choir loft of the Society of St Pauls’s Church in Alba, Italy, and who had survived the oppression of the Communists in China in the 1950s, was the first Pauline to die on Australian soil. He is buried in the Carlton General Cemetery in Melbourne. Shortly afterwards, Br Jospeh Barbieri arrived in Melbourne to form the initial Scoresby community with Fr Joseph Chircop and two students, Michael Goonan and Leo Orland. Though the focus of the house was formation, a small printery was set up in a shed on the property and some commercial printing was undertaken to help pay the bills, a course of action adopted by most Pauline communities, including the Homebush community, in their early years. In 1974 the community began publishing Our Sunday Celebration, a bulletin for parishes containing information about the liturgy of the Sunday. 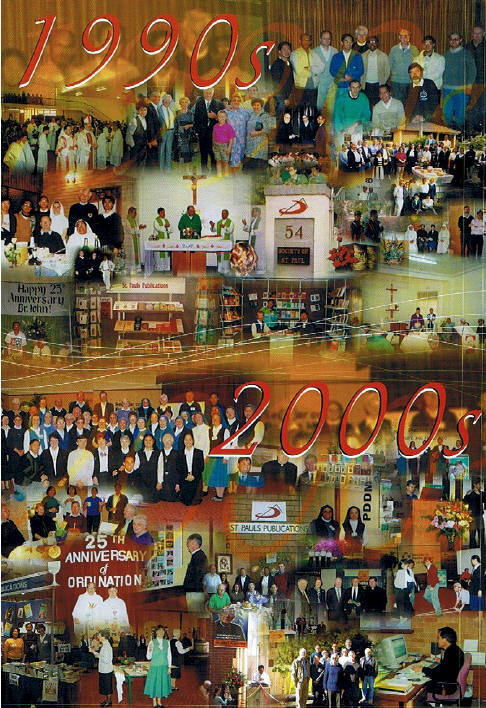 Beginning with subscriptions from just a handful of parishes the bulletin’s circulation grew steadily. Later a second bulletin, focusing of the Liturgy of the Word, called The Saving Word, was commenced. 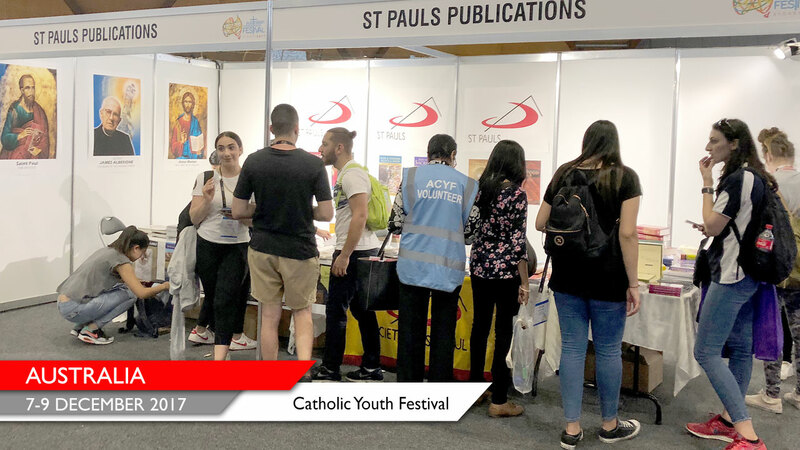 These two bulletins continue to this day with approximately 100,000 copies being circulated to about 350 parishes around Australia each week. In 1977 a small audio-visual apostolate was established in Scoresby producing talks and music on cassette. It continued for some years before a scarcity of personnel necessitated its closure. The period from the mid seventies to the late eighties saw an ongoing consolidation of the congregation and its activities in Australia, The greater facility of travel opened possibilities for the interchange of members. Gradually, the first members to come to Australia who were mostly Italian were replaced by other members coming from Asia, most notably from India and the Philippines. Fr Andrew Pudussery arrived from India in 1982. Nestor Candado was the first Filipino-born member to be assigned to Australia. He was still a student for the priesthood when he arrived in December 1981 and was ordained in St Jude’s Church in Scoresby in December 1983. 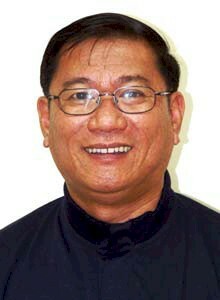 Br Domingo Vargas arrived in Australia from the Philippines in 1984 to be followed in 1989 by two more students from the Philippines, Norman Pena and Noel Magbanua. One year previously Br Stephen Scalise from the United States joined the Strathfield community. In 1980 Fr Mario Gandolfi came to Australia for one year as the Delegate of the Superior General with authority to coordinate the activities of the houses of Sydney and Melbourne. Until then both houses were directly dependent on the General Government in Rome with only a loose internal relation. 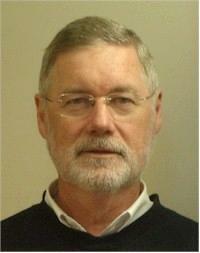 A year later Fr Peter Campus arrived in Australia to take on the role of Delegate of the Superior General. A native of Sardinia in Italy, Fr Campus had served in the Philippines for many years. On his arrival, Fr Campus was amazed to find that the Wantirna Sth printery was housed in what was little more than a shed. With the Sunday bulletins prospering, the tiny printery had become cramped and uncomfortable. He authorized the construction of an apostolic building on the Scoresby property that would house a printing plant and administration offices. This building was blessed by the Superior General, Fr Renato Perino, in December 1983, on the day of the First Mass of Fr Nestor. Shortly afterwards Fr Campus was assigned back to Italy where he was involved in the management of the Pauline periodicals in Milan. Later he would be appointed to the General Government of the Society of St Paul and in April 1998 he was elected the sixth Superior General of the congregation, an office he currently holds. Fr Campus was replaced by Fr Gabrielle Di Giovannantonio who unfortunately was found to be terminally ill with cancer shortly after his arrival in Australia. 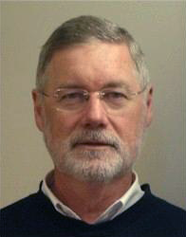 In December 1985 Fr Michael Goonan was appointed Delegate of the Superior General for Australia and in 1988 the two houses in Australia were formed into self-governing Region of the congregation with Fr Michael appointed the first Regional Superior. The growing unification of the two houses led to a better co-ordination of apostolic activities. 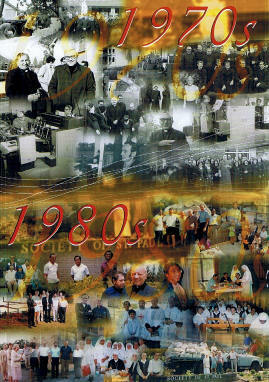 By the mid-1980s the Society of St Paul was operating two large printeries in Australia. A decision was taken to close the printery in Homebush and consolidate all printing activities in the new printery in Wantirna Sth, Melbourne. Homebush would continue to operate as a publishing house but all printing would be done in Melbourne. New machines were purchased for the Melbourne printery. The first book to roll off the new press was The Pope in Australia, a collection of the talks and homilies given by the Pope during his historic visit to Australia in 1986. Fifteen thousand copies of the book were sold within three months of the Pope’s visit. In 1989 Fr Bruno Colombari arrived in Melbourne from Italy. His first task was to oversee the creative design and layout of the publications. In 1991 Fr Andrew Pudussery was appointed Regional Superior of the Australian Region, to be followed in 1997 by Fr Nestor Candado. More recently Fr Michael Goonan has resumed the role. In 1993 the Society closed its printing plant at its Melbourne house. In the space of six years the Paulines went from operating two large printeries in Australia to operating none. In this it was replicating a trend that was occurring in Pauline Houses throughout the world. With fewer vocations and members ageing there were no longer sufficient able-bodied members in the congregation to undertake the heavy work of the printing plant. As well printing equipment had become very high-tech and expensive, and it was more cost effective to outsource the printing of books. Most significantly, however, it was recognized that members of the congregation should direct their energies into the creative, phases of the apostolate (editorial, design) and into the promotion and diffusion of religious materials. The actual printing of books and bulletins could be entrusted safely to commercial companies. Following the closure of the Melbourne printery the large property at Wantirna Sth was sold and the Melbourne community transferred to a house that had been purchased much closer to the city in the suburb of Kew. The community was entrusted with the task of vocations’ promotion and the promotion of the congregation’s publications. The closure of the printery and house at Wantirna Sth had created the space for a new apostolic initiative to emerge and that duly happened in December, 1995, when the Archbishop of Brisbane invited the Society of St Paul to take over the operation of the Archdiocese’s book centre located near the Cathedral. In early 1995 Fr Bruno Colombari and Deacon Norman Pena moved to Brisbane and in May of that year, St Paul’s Book Centre was blessed and officially opened by Archbishop John Bathersby. Fathers Bruno and Norman, the founding members of the Brisbane community, were to remain together in Brisbane building up the book centre until early 1999 when Fr Norman left for Rome to undertake further studies. He was replaced by Fr Ruben Nadalich who had recently arrived from Argentina. In 1999 the Society purchased an apartment for the community in the Brisbane CBD, within walking distance of the book centre. The Brisbane book centere has proved a very positive activity for the congregation and a service much appreciated by the people of Queensland. It was through St Pauls Book Centre that a young Brisbane man, Christopher Brennan, came to know of the Society of St Paul. Chris entered the congregation in 1998 and is continuing his formation in Sydney where he assists also in the editorial department. In time it became apparent that the successful establishment of a new house and book centre in Brisbane called for a reassessment of the congregation’s resources and possibilities in Australia. It was decided to close the house in Melbourne to enable a concentration of apostolic energies in the Sydney publishing house and the Brisbane book centre. The house of Kew was sold in late 2002. 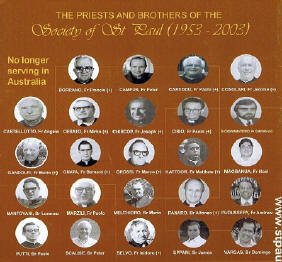 The Society’s presence is not, however, completely gone from Melbourne as Br Jospeh Barbieri, a member of the Melbourne community since 1972, continues to live there and other members of the Society of St Paul visit regularly for reasons of apostolate and for functions associated with the Pauline family. Throughout the 1990s and to the present day, the publishing activities of the Sydney community continued, with many books by Australian authors being published along with a number of international co-publications. A major project was the publication of the Australian edition of The Catechism of the Catholic Church in 1995. The publication of Sunday bulletins and Church documents continue to be important activities, overseen currently by the bulletins and documents editor, Fr Michael Byrnes. Recently the Catholic Bishops have asked St Pauls to be involved in liturgical publishing. The Rite of Christian Initiation of Adults and Pastoral Care of the Sick will be the first two liturgical texts to be published on behalf of the Bishops’ Conference by St Pauls. For the Society of St Paul, as for all religious congregations, the administration of apostolic activities became much more complex in the nineties as a result of changes in government legislation and the greater involvement of lay people in apostolic activities. Br Noel Bagnall has played a major role in restructuring the apostolic administration, a task continued today by Fr Nestor Candado. 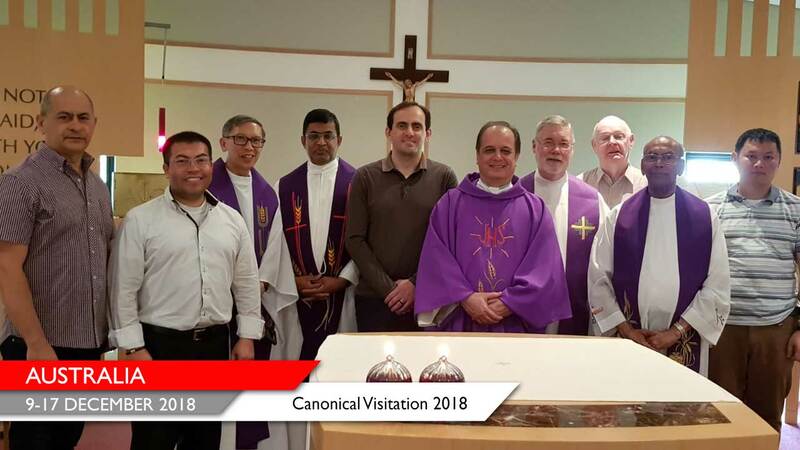 Since his return from Rome, Fr Norman Pena has fulfilled an important role in leading the congregation through the intricacies of the information technology revolution. In recent years the Australian Region has assisted Paulines from Korea and Japan to learn English. It has been commonplace for the Strathfield community to have one and sometimes two members from these countries with us for a year or two to learn English and experience a different cultural setting. Their presence provides vitality and new vision to the community. Presently the community is hosting Cleric Silvano Han from Korea. The last decade has seen a much greater involvement of other religious and lay people in our apostolic activities, which is now greatly dependent on their collaboration for its continued development. The story of the last ten years of the Society of St Paul in Australia would be incomplete if we failed to acknowledge the generous contribution these collaborators make to our life and mission. We also acknowledge the great help given to us in our early days by a number of Italian families, themselves immigrants trying to establish a new life in this country but always willing to help the ‘Paolini’ in any way they could. We are also in the debt of many religious congregations, bishops, clergy and lay people who have helped us in various ways over the past fifty years. Their names are too many to record and sadly, some have surely been forgotten. But their names are writ in heaven. They are all a part of our story and we remember them with gratitude. On 27 April 2003, Fr James Alberione, the founder of the Society of St Paul and of the Pauline Family, was beatified by Pope John Paul II. Many people chose the occasion to express their congratulations to us and their appreciation of the contribution we make to the life of the Australian Church. 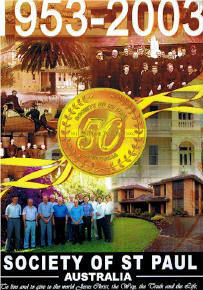 The Society of St Paul has remained a small congregation in Australia thoughout its fifty years in this country but by the grace of God and with the help of many people we have made a contribution to the life of the local Church and we hope we can continue to do so for many years to come. 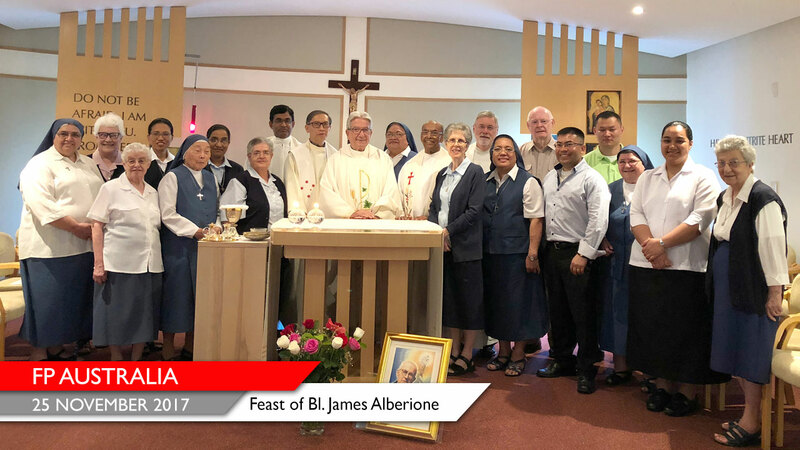 For as long as we can, we will continue to be faithful to the task entrusted to us by our founder, Blessed James Alberione, ‘to live and give to the world Jesus Christ, the Way, the Truth and Life’. Lo ha nominato nell’incarico il Superiore generale don Valdir José De Castro con Decreto del 4 dicembre 2015. Don Michael, 64 anni, è nato a Beechworth (Victoria, Australia) il 22 giugno 1951. Entrato in Congregazione il 31 gennaio 1969, ha emesso la prima professione religiosa il 24 gennaio 1971 a Homebush. Ordinato presbitero il 28 maggio 1977 a Wodonga, ha precedentemente conseguito il diploma in Giornalismo alla RMIT University di Melbourne (1976) e il baccellierato in Sacra Teologia al College of Divinity di Melbourne (1977). Apprezzato autore di agili volumetti attenti alla spiritualità contemporanea, ha ricoperto vari incarichi nella Società San Paolo, fra cui quello di Promotore vocazionale, di Maestro dei novizi, di Direttore editoriale e di Superiore regionale dell’Australia (per due mandati, 2003 e 2006). Infine, dal 2012 ricopriva il ruolo di Direttore generale dell’apostolato della Provincia Stati Uniti, incarico che si accinge a lasciare per ritornare in Madrepatria come Delegato personale del Superiore generale per un anno. 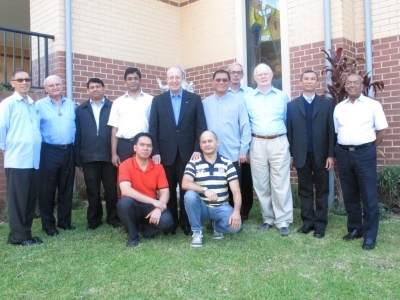 On the 13th of December 2014, the SSP members of the Australian Region gathered at Strathfield Community in Sydney NSW for the Regional Assembly. The regional superior, Fr Ruben Areno, presented the state of the region and the challenges that it faces in the years ahead as we are heading through a crucial transition in the change of governance. Discussions on important issues were raised, and some amendments done; and generally the report was accepted by the Assembly. Afterwards, the election of delegate to the X General Chapter followed. 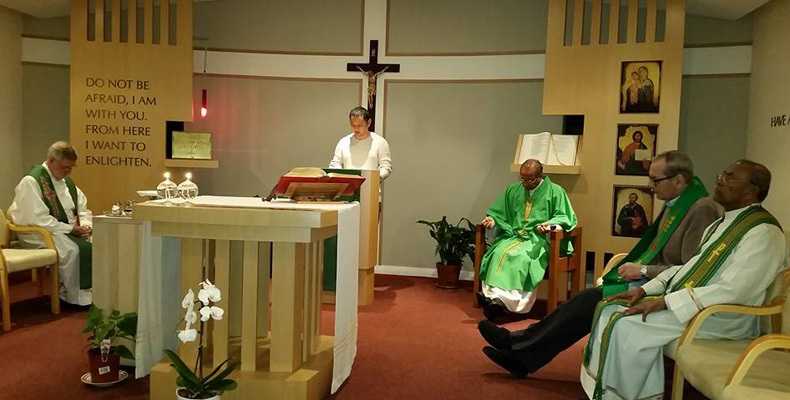 Fr Thomas Abraham Manimalayil was officially elected as the delegate; and Fr Nestor Candado as his substitute. Members of the Australian Region gathered in Sydney for their Regional Assembly (4-5 February 2013) participated by members from both communities of Brisbane and Sydney. The Superior General Don Silvio Sassi and the Vicar General Don Celso Godilano are also present for this assembly. They arrived on the 2nd of February where they had preliminary meetings with the out going Regional Superior Fr Nestor Candado and with the New Regional Superior Fr Ruben Areño. On 5 February 2013, Tuesday, members of the Australian Region gathered in Sydney for the second day of their Regional Assembly 2013. After reading and approving the minutes of the first day, 4 February 2013, the assembly members proceeded to review the Statute of the Society of St Paul for the Australian Region. It was approved by the Assembly for the next three years without any major changes. Lo ha nominato nell’incarico il Superiore generale don Silvio Sassi con Decreto del 26 settembre 2011. Don Ruben Areño, 56 anni, è nato a La Paz (Iloilo City, Filippine) l’11 febbraio 1956. Entrato in Congregazione il 29 giugno 1969, ha emesso la prima profes-sione religiosa l’11 giugno 1978 dopo aver terminato gli studi filosofici e il novi-ziato. È stato ordinato sacerdote il 24 marzo 1983 al termine degli studi teologici nel Seminario Maggiore San Carlo. Ha poi perfezionato i suoi studi con la specializzazione in spiritualità alla Gregoriana in Roma, dal 1991 al 1993.